I am devastated!! Today my beloved arm candy Micheal Kors MK5161 watch broke!! I thought I write as post about this as this is not the first time for this to happen and also a lot of people comment on my Micheal Kors watch so I wanted to let you guys know what can happen and also enquire have any of you experienced this with your watches? I bought my watch from the Watch Shop in October 2010 for £300. Yes £300 and it has broken twice!! It first broke in December 2010 after only having it for 2 months. One evening it simple fell off my wrist when I was watching TV. Thinking it would only be a simple repair and that my warranty said the strap was not included in the warranty. I brought it into my local jeweler who informed me that he would not fix it as the watch strap in ceramic and he could not fix the broken link, but he kindly informed me that I should return it to Micheal Kors as it was poor workman ship and that my watch was in perfect condition (had never been dropped or abused) so it should be covered under warranty. The next day I contacted the Watch Shop who were amazing! They gave me all the information I needed and suggested I send it back to Micheal Kors. So I shipped my watch off by registered post and about 3 weeks later received my watch repaired free of charge. The service from Micheal Kors and the Watch Shop could not have been better. Just yesterday the same fault appeared again and it fell off my wrist while I was out shopping which resulted in a tiny scratch on the face. I am going to sent it back to Micheal Kors again as it is the same as the original fault and I have never dropped my watch or damaged it in any way that it could break like this. For £300 I would expect the watch to last more than 18months. I just hope they will repair as it is my favourite watch and would be devestated if it would not be repaired and I really don't want to change to a different watch. Have you guys experience any faults like this? What did you do? 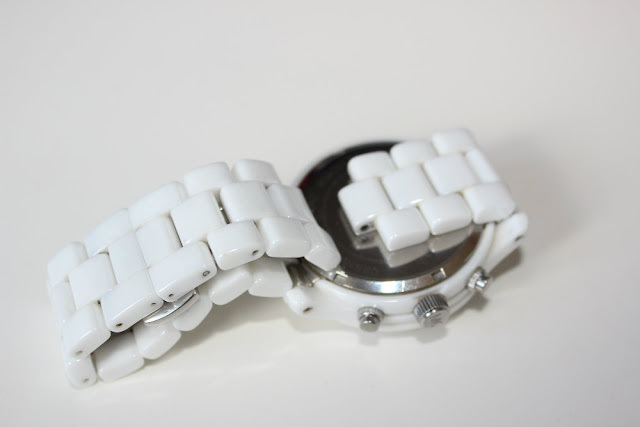 Is it the ceramic straps that are more prone to breaking? It's a Lovely Watch, I Don't tend to Wear Watches though. I hope you get it replaced again and it lasts longer this time. £300 is Alot to Pay. My ICE watch broke after a few months, too. They replaced it for free but only this replacing took about 5 months!! Oh no, that's so unfortunate that it's broken twice now. It is a really gorgeous watch, very reminiscent of the Chanel J12. this is such a great watch! its a pity it broke.i never had a watch with ceramic straps before but i think it is repairable. 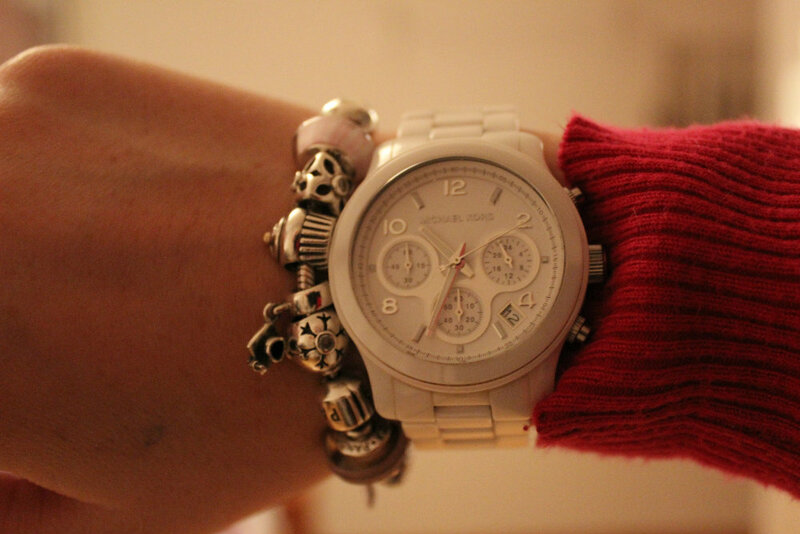 That is such a gorgeous watch! I'm really sorry it broke on you :( I've not had this kind of problem, so I won't be of much, but I hope you get it resolved soon. That's awful, I love that watch. I wear my MK one every day and haven't had a problem with it in a year since I got it. That really is too bad. It is a striking watch. I hope you can get it repaired without issue. I'm so bad with watches that if the battery dies, I act as though the watch is broken for good. 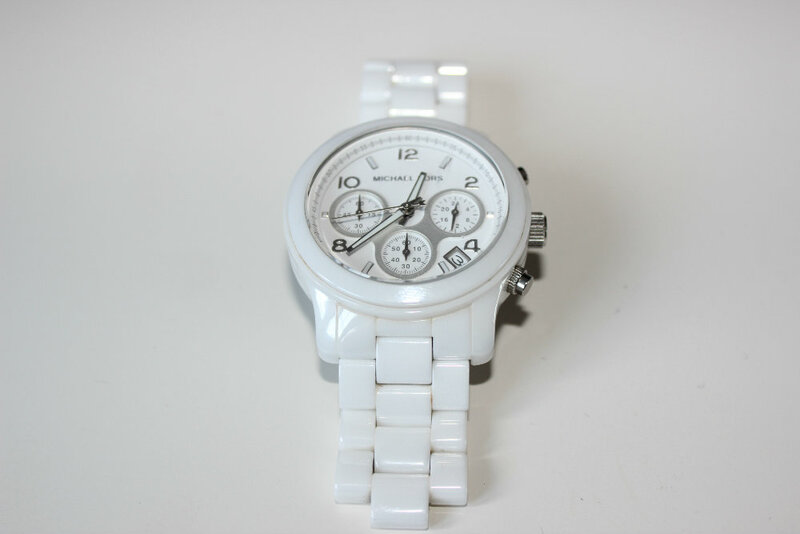 Gorgeous watch, that is so pretty.I have a white Chanel watch in white ceramic. Shame it broke. Just came across your blog, think you sent it to me on twitter :) great to find another Irish blogger. Really interested in this post as I am hopefully going to 'invest' in a MK watch! hope that it will be covered under warranty and you'll get it fixed. I would be livid if my £300 watch broke not once but twice. I thought the purpose of buying higher end products was that they are well made!! I bought my fiancés Stuhrling watch (org $300) on Overstock and it stopped working less than a year after buying. I sent it to the company to fix. P.S. 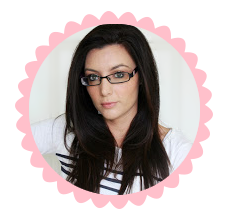 Thanks for sending me your link during #bbloggers just wanted to drop in and say hey! Oh sweetie:(I jus loved it at first sight.Its bad to hear that it broke.Hope u get it repaired soon:) found u through blog hop.How about following each other.